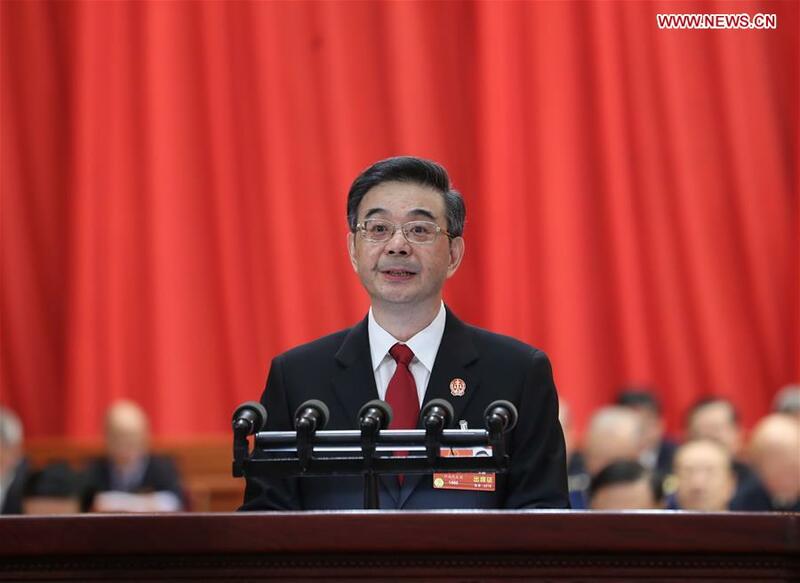 BEIJING, March 9 (Xinhua) -- Zhou Qiang, China's chief justice, delivered a work report of the Supreme People's Court (SPC) on Friday at the first session of the 13th National People's Congress. -- The SPC heard about 82,383 cases and closed about 79,692 ones, up 60.6 percent and 58.8 percent over the previous five-year period respectively. -- Local courts nationwide heard about 88.97 million cases and closed 85.98 million ones, up 58.6 percent and 55.6 percent over the previous five years respectively. -- A total of 6.07 million suspects were convicted in the first trials of 5.49 million criminal cases. -- A total of 195,000 graft cases including bribery and embezzlement were concluded, involing 101 officials at and above ministerial level. -- A total of 42,000 criminal cases including offenses related to food and drug safety were concluded. -- Chinese courts reopened trials of 6,747 criminal cases and rectified the sentences. -- A total of 2,943 suspects prosecuted by the state were acquited. -- A total of 31,527 convicts were granted amnesty. -- Chinese courts tried 683,000 cases of intellectual property rights. -- Chinese courts heard 1,383 public interest litigation cases for environmental damage lodged by prosecutors, and another 252 such cases filed by non-governmental organizations. -- A total of 85 judges died of fatigue or assaults on duty. -- The SPC punished its 53 staff members for violating Party disciplinary rules and law. -- A total of 3,338 staff members at local courts nationwide were caught misusing their power, 531 of whom were prosecuted. -- A total of 1,762 leading officials of courts were held accountable for poor leadership. -- The SPC will launch a large-scale education campaign of Xi Jinping Thought on Socialism with Chinese Characteristics for a New Era, and the spirit of the 19th Communist Party of China National Congress. -- The SPC will step up crackdown upon infiltrative, subversive and separatist activities, terrorism, organized crimes, porns, gambling, drugs, human trafficking, pyramid schemes, illegal fundraising, and graft. -- The SPC will create a better legal environment for economic development and enhance protection of property rights. -- The SPC will provide better judicial service for ordinary people, respect lawyers' right to exercise their duties, and make sure the execution of court orders. -- The SPC will continue pushing forward judicial reforms. -- The SPC will further enhance transparency of court proceedings and legal documents. -- The SPC will discipline judges and court staff more strictly and uphold a zero tolerance policy on corruption.